I had high hopes that the recent warm temperatures had melted the snow on the trails at Stillwell Woods. After days of 40, 50 (and briefly, 60) degree temps I thought that was a reasonable expectation. I was very surprised to see that the local temperature was 19 degrees this morning and when I arrived at Stillwell I saw that the melted snow had refrozen into ice and hard icy snow. I wore my Helly Hansen Trail Lizards in anticipation of rough terrain and set off over the packed but rutted ice and snow. I was still hoping that the interior trails would be bare and more runnable, perhaps protected from the canopy above. I wore my Garmin and also brought along my iPhone to capture my route using MotionX. It had been a long time since I carried the iPhone on a run and used that app. The app has been updated numerous times since then and after the first minute a robotic female voice said "You have run for one minute and have traveled zero-point-one-0 miles. Your pace is ten minutes per mile." That spooked me but then I realized that my robot friend would be "updating"me on progress every minute going forward. I considered switching off the MotionX app but decided that I'd just let it go as I didn't want to play with my iPhone while I ran on these tricky trails. 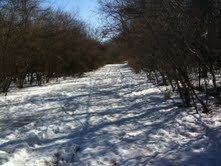 The trails were covered by hard snow rutted with impressions from hikers, runners, animals and mountain bikers. I didn't sink into the snow but the ruts that were formed when the temperatures were higher were a few inches deep and a misstep would easily result in a sprain or fall. There were small exposed dirt channels at the edge here and there and I ran on those when I could. The progress reports from MotionX kept coming and I couldn't believe each time that another minute had passed. I enjoy a hard challenge, especially on the trails, but I was growing concerned that I'd trip on a rut and get hurt. I followed the path back to the open field and finished my run with two laps around the perimeter. The field was mostly devoid of snow because the sun had gotten to it so my last mile was on muddy dirt and grass. I was happy to be back to the woods for the first time in 2011 and it was a different kind of workout than I'd expected to get. I was so happy to have chosen the Helly's for the job today. I'm going to head to Bethpage State Park this week and get an Empire Passport so I can get free access into the NY State Parks where I normally have to pay admission. It will be nice if Bethpage's bike trail is clear when I go there. The 14 mile out-and-back route (or 10 or so miles of it) would be a good kick start to my half marathon training.